In a rather unsurprising but still tyrannic move earlier this week, Apple hinted at removing one app from the AppStore if the developers didn't remove the Android mention from their app description. They apparently considered it promotional text mentioning Google’s Android platform, and not what the developers named a marketing strategy to increase sales. 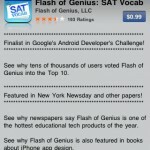 The application in question is Flash of Genius: SAT Vocab and the lines to be removed read: "Finalist in Google’s Android Developer’s Challenge!" 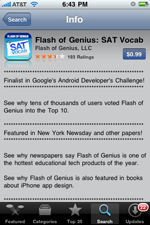 Apple still approved the app which was available for a short period of time in the AppStore with the Android description, but went back on its decision and said that "to avoid an interruption in the availability of Flash of Genius: SAT Vocab 2.2 on the iPhone App Store" the developers should do well and remove those "extra" lines. (full blog post from the developers of Flash of Genius here). Having the basic background of the deal, I have to say there are two sides to it, as with all stories. On the one hand, Apple probably made a good decision. I own a Playstation, and I wouldn't particularly care if the game I wanted to buy was some bestseller on XBox. That said, if Flash of Genius wants to advertise its app as being a sweet piece of work on the Android, their website is the best place to do it. On the same line here, if we look at the screenshot from the AppStore before the lines were removed, we see that the developers chose to begin their app description with just that. We got it, it rocked the Android, but that means basically nothing to me, the average iPhone user. Rephrasing it and placing lower in the description would probably lead to a decrease in sales, but if you're trying to sell an iPhone app based on its success for the Android market, then you shouldn't be in the AppStore in the first place. That being said, Apple has also done it again, so to speak. I remember when Jobs came back to the company, for good that time, he did the one thing that everyone thought was unthinkable. He partnered with Microsoft. Microsoft bought shares in Apple, and Apple continued to thrive. Back then, Jobs said one thing that stuck to my mind till now: "We need to stop thinking that for Apple to win, Microsoft has to lose. No! For Apple to win, Apple has to do good!" I don't have the exact quote, but that was what the man said back then. So my point is that Apple needs to continue on that belief and encourage competition. Mentioning an app winning a prize of some sort for the competitor platform shouldn't be looked down upon. After all, we chose Apple because it wasn't after our money, it wanted to make our whole computing experience that much better. 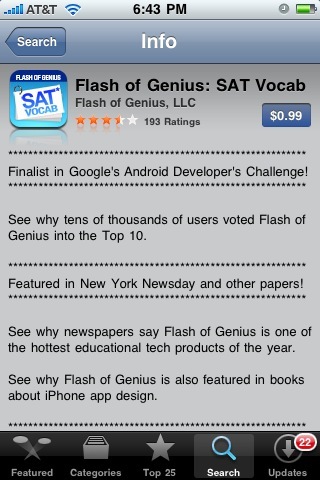 I think Flash of Genius should try and get their description rephrased and reorganized and talk things over with Apple. There has to be a middle way for us, the consumers to win, right? At least that's my two cents on the deal.